The following comments about attractions in Minneapolis have been posted from individuals. We believe that the best reviews of Minneapolis, Minnesota (MN), MN USA are written by travelers and holiday makers who have experienced Minneapolis first hand and want to share their thoughts. Can you share yours? Please help us expand this section of our Minneapolis World Guide. 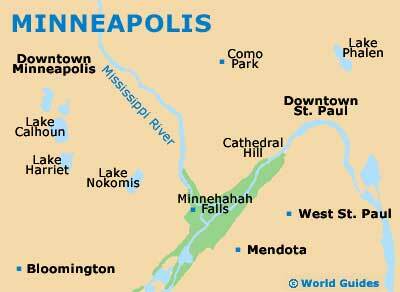 Let us know what you think about the attractions in Minneapolis, Minnesota (MN) USA. Submit comments about Minneapolis attractions here. There is a prominent statue of Mary Tyler Moore in downtown on Nicollet Avenue. She was a well-known celebrity and has here own TV show in the 70s which was based here, in the city, in the building behind the actual statue. She was also nominated for an Oscar for here role in the movie Ordinary People and seems to be fondly remembered very fondly be the locals for here cheery and friendly persona. This is one of several Mary Tyler Moore tributes dotted aound the city. Many people here call this university the 'U of M', probably because the can't be bothered to say it in full. Anyway, it is really quite an impressive complex and is split into two main campuses, at Saint Paul and Minneapolis. The Coffman Memorial Union is worth looking out for and is on the Washington Avenue. There are also some other interesting parts, so just go for a wander around. There are over 50,000 students here, so it is very big. Please note that these Minneapolis, Minnesota (MN), MN USA comments and reviews are posted by individuals and are not necessarily the views of World Guides.